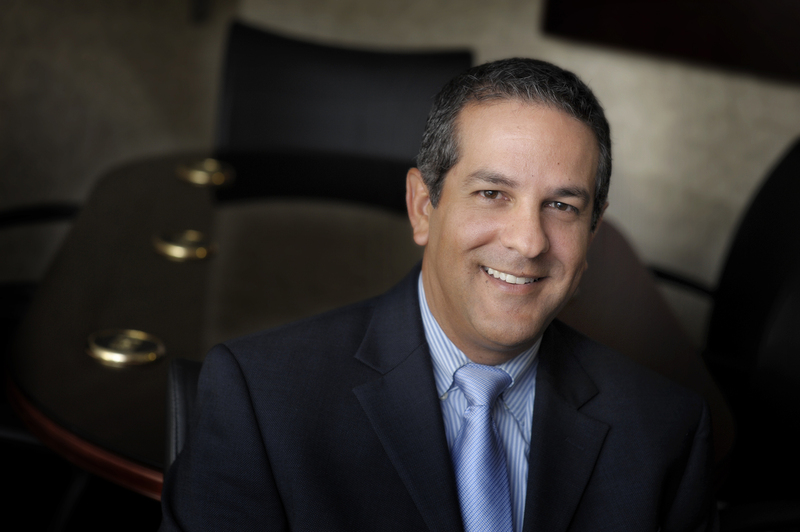 As Executive Vice President and Chief Financial Officer of Florida Hospital, to say that Eddie Soler has a lot on his plate is an understatement. With 2,100 beds and seven hospitals within the system, Eddie is tasked the enormous responsibility of serving the community while managing an incredibly complex health system. But Eddie is not a man who takes a break; when he sees there is a need, he acts. He was especially motivated to take action in 2011. That year, CBS’ “60 Minutes” program did a report on homeless families—including those with children—living in their cars or cheap motels. It was a watershed moment for Eddie. This motivation led him to Heart of Florida United Way, where Eddie serves on the board and continually volunteers his time and expertise. What made you get involved with United Way? United Way always had such a strong relationship with Florida Hospital, so I was introduced to United Way’s work through my professional relationship. The more I learned about United Way’s work, the more I realized how much they do in the community. The scope of their work is incredible, from ending homelessness to improving graduation rates in Central Florida. Then when I joined United Way’s Board and saw the accountability process—where partner agencies are evaluated and results are measured—I saw firsthand the kind of impact United Way makes. What causes you to volunteer? It’s part of Florida Hospital’s culture. We have a Bible verse printed on a lot of our materials that promotes caring for the community “because if it prospers, you too will prosper.” Helping just one person benefits the whole community and that has shaped my own personal philosophy as well. What do you think is the biggest community need in Central Florida? Homelessness in Central Florida continues to be a major issue, but the ALICE report really startled me; the data is staggering. There are so many people in our area who are working hard but can barely make it. They’re just one unexpected expense—a medical bill, a car repair—away from financial disaster. These are huge issues that needs someone to lead the charge to make it better, and that someone is United Way. What do you think United Way should tackle next? Education is key. There is a direct link between the level of education and income and lifestyle. United Way has the potential to make great inroads in helping students graduate and get a post-secondary education or learn a trade so they can make a good income. I can’t pick just one, but how about a phrase? “Community Champion.” United Way provides comprehensive solutions for sustainable change. What is one thing about United Way you think most people don’t know about? So many people think that United Way just helps the poor, but it is so much more than that. It offers assistance for all people, from education to health. The 2-1-1 Information and Assistance helpline is amazing, providing crisis aid. The reach of United Way is much bigger than most people realize. Whether it’s his deep booming voice, gregarious greetings for colleagues or his commanding presence, when Tony Ortiz enters a room you know it. When you consider that the City of Orlando Commissioner for District 2 is also a former police officer and retired Marine, it only adds to his stature. Tony describes serving in the Persian Gulf War as an honor and emphasizes the camaraderie developed between veterans. But when you see your comrades hurting, suffering or in-need at home, it’s “mind boggling.” This is why Tony joined United Way’s effort to do something about it. What are the biggest challenges for our veterans in Central Florida? We have to find a way to connect veterans with the resources that are available and the people/organizations they trust who are there to help them. There isn’t a shortage of resources. The problem is that it is just near impossible to navigate the system successfully in a timely fashion. For the average veteran family, money is also a big issue. Many won’t be financially stable and won’t be able to readjust immediately to go back to work. They’ll need to be retrained to go back to work first. We need a central location for veterans to go to and find the assistance and direction they seek and need. On June 11, United Way launched a new initiative for veterans, Mission United. You have been part of that effort since the beginning. What needs do you see Mission United filling? A lot of our veterans are coming home and don’t know where to start to get help. Mission United makes an easy one-stop shop for veterans. All they need to do is call 2-1-1 to begin the process. Besides the challenges with the system, our young veterans need direction along with the support services. Mission United is focusing on the areas of education, legal assistance and employment. Many are coming back with a unique set of tools. Some are usable, some are not. But the character building that happens in a time of war, it’s a profound experience. They need direction and need someone to take their hand and help them readjust. I see Mission United as that support that takes them by the hand and guides them where they need to go to get the help they need and deserve. As an elected official, you are closely connected with the community. How do you see United Way’s work in the community? United Way has always been there for our community. They are an essential part of our community. I remember when I was in law enforcement that I used to refer some victims to United Way to get help. I’ve also seen a lot of people during these tough economic times looking for help and they go to United Way for assistance. United Way helps the homeless, those who don’t have food, families weathering bad times when the economy collapsed; United Way is always there for them. What do you see as a community need? Right now, homelessness is possibly the community need with the most demand. A lot of our military personnel are coming back to a very challenging dynamic. I’ve encountered quite a few homeless individuals who are veterans. I also see the need for educating our most vulnerable people to learn about the resources that are out there. United Way is definitely a pathway for people in terms of getting help, knowledge, access, etc. It fills the gap in so many ways and acts as a liaison between entities. United Way ties everybody in. What value do you think United Way brings to the community? United Way brings a sense of humanity, which is possibly the most important value. It brings a sense of duty towards our fellow human beings. We have to get involved. What’s neat is seeing how United Way is growing. It goes with the principle “if you give, it will come back” and often, ten-fold. It’s the nature of giving. I’ve seen how the institution has grown and the people getting involved have a lot of enthusiasm. More so, these are people who have extensive expertise to help guide the way as well. What one word would you use to describe what United Way brings to Central Florida? “Empowerment” — empowers with knowledge, resources, confidence, and helps find solutions for people. From the time he first came to Orlando, Chad Wilson, District Manager at Publix, has always been inspired by the dynamic community and was motivated to contribute any way he could. Dedicated to service, he volunteered with a local food bank, providing assistance to the homeless in the area. 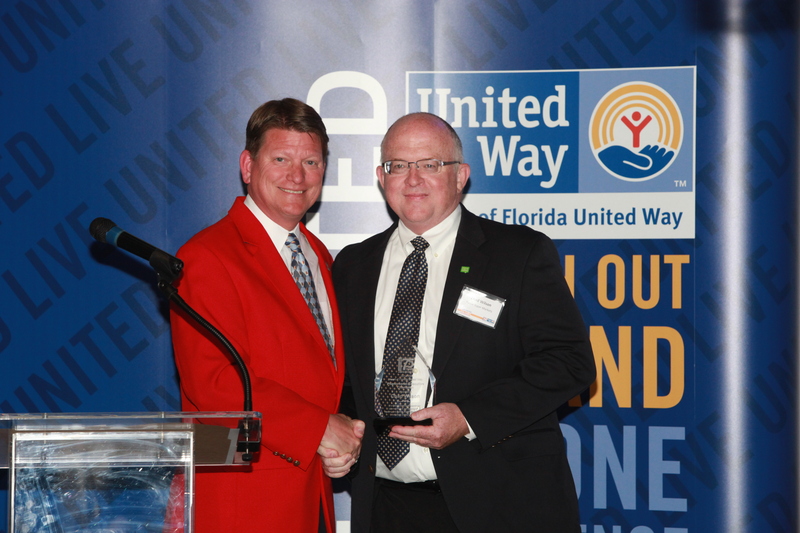 He first heard about Heart of Florida United Way from the leadership at Publix in 2000. Chad saw leading United Way volunteer projects as a development opportunity. Volunteering and community service is very personal to Chad and he views it as an essential aspect of his family’s life. Volunteers make a huge difference, and Chad strongly encourages people to consider volunteering in their community, especially with the United Way. Volunteers are essential to what the United Way does. Our Volunteer Resource Center matches volunteers—both individuals and corporations—with hundreds of local nonprofit agencies to create exceptional volunteer experiences throughout Orange, Osceola and Seminole counties. If you are interested in volunteering, please visit the Volunteer Resource Center. On any given night, an estimated 10,000 residents are living on the streets, staying in shelters, sleeping in cars or doubling up with friends and relatives. Even more heartbreaking, the fastest-growing segment of this population is families with children, who represent the new face of homelessness. Providing basics needs, like shelter and food, is part of Heart of Florida United Way’s focus area aimed at alleviating hunger and homelessness. 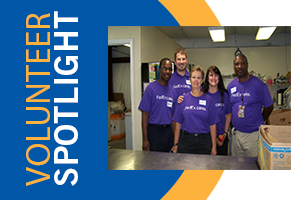 Kevin and FedEx have demonstrated exceptional commitment to this focus area by donating much-needed food, but most importantly donating their time. These dedicated team members coordinated a pickup for hundreds of canned goods and toys from several locations, including scheduling FedEx drivers to pick up and deliver goods to Christian HELP. FedEx employees then assisted with assembling the goods into boxes while another group assisted clients during the canned food and toy distribution. Please stay tuned for more information about HFUW Community Volunteer Excellence Awards and other nominees throughout Volunteer Appreciation Month! Want to see how you can volunteer this month? The Volunteer Resource Center can help. Every day I intern at United Way, as cliché as it sounds, is an adventure. Coming into the office this morning, dressed in heels, a skirt and a blazer, I was not expecting to be traveling to the Edgewood Children’s Ranch, but today marked the sneak peak of United Way Days of Caring and I was lucky enough to attend. In case you haven’t heard, Days of Caring is Central Florida’s largest community-wide volunteer event, which kicks off this year on Friday. This year dozens of projects are scheduled and we are expecting a turnout of nearly 1,800 volunteers. After the sugar and excitement fully kicked in, volunteers handed out clappers to the kids which they put to good use when Orlando Magic Forward Bo Outlaw appeared. Standing tall and strong at 6’8, Bo was a huge hit as he took pizza orders, danced with the children, and of course kept Stuff and Thunderbug under control. Also joining the fun was retired NHL player Dave Andreychuk, who now serves on the Lightning’s executive board. 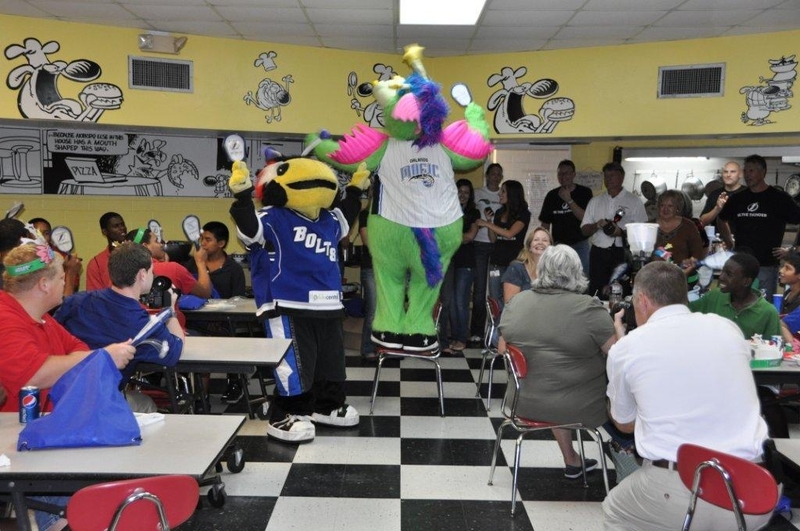 Both he and Outlaw took time to sign autographs, pose for pictures and visit with the kids. After lunch, everyone lined up outside for a final group shot, sporting their Stuff headbands and Lightning blue shirts. With that came the best part of the day when the kids hugged the players and thanked them for coming. The air kiss I received from Stuff was a close runner up. While interning at United Way, I’m learning a lot about my major in marketing, but I’m also seeing all the great things United Way does in our community. Days of Caring is a terrific, fun way to give back and make a difference. Judging from what I saw today, I’d encourage anyone to get involved this Friday or throughout the year. Click here to learn more.